The GX3348 is a multi-channel analog I/O 6U PXI card which provides (3) programmable sources, and a 4 x 48 or 4 x 64 matrix - allowing the user to route the 3 sources, or ground to any of the 48 or 64 I/O channels. In addition, each I/O channel can be connected to a 16-bit A to D converter, providing DC voltage measurement capability for each channel. 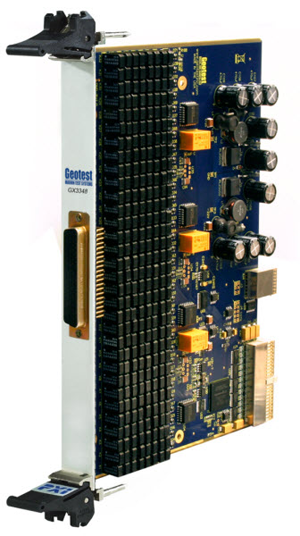 Each I/O channel also includes DC measurement capability; allowing each input channel to be monitored and facilitating module self-test. Combined maximum output current for all programmable sources is 500 mA. If using the external source inputs, 5 VDC or ground connection, maximum current is limited to 3 A. An onboard EEPROM contains the DAC’s and ADC’s calibration parameters.